Writes volume automation for you! The HoRNet AutoGain has been designed with a specific purpose in mind: drastically shorten the time it takes to create volume automations. Here it comes the HoRNet AutoGain to the rescue. It has two different inputs, in the main one put the track you want to automate, in the second one your volume reference, it may be a single track, a track group or the whole mix, press play and let the HoRNet AutoGain work its magic. It will try to keep your track level to the same of your reference, you can adjust speed, sensitivity and gain range. Try it on a vocal track and when you are done put it into “write mode” to have the volume automation written for you! Have a look to the video example! I am a notorious type A about my mixes. I've always been very picky about riding gain in a mix, particularly on vocal parts. I have never thought of a mix as a static thing, and there is very little "set it and forget it" in a great mix. When it comes to vocals especially, evening out a difficult vocal is usually not a job for a compressor (or three) alone. Gain riding is a must. 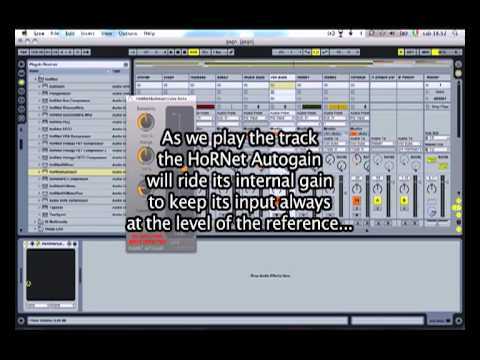 HoRNet's Autogain is a huge time saver for me. The first day I owned it I used it on a mix for a person who is hands-down the most difficult-to-mix vocalist of all my clients. She will jump from a quiet whisper to a shout that will burn the hair off your head dozens of times per song. And to be honest, when she get's loud she also tends to get harsh, sometimes extremely harsh, so slamming compressors is not the answer. Along with typical wideband compresseion, historically I've also used multiband compression, dynamic eq, de-essing and automated eq to help with this. There is no set it and forget it here, though. Autogain came through for me right away. Took about two minutes to work out how to set it up, a few minutes of listening to optimize the settings, and 5 minutes to let it write the automation. Right away it saved me 45 minutes. Then, I was able to copy the written automation curve to adjust other parameters, inverting it to automate an eq on some trouble frequencies, or have the gain pre or post compressor(s). All in all, with a little tweaking I had a great result in about a quarter the time. And this was on a very squeeky vocal track. To be clear, you can do anything that this plugin can do by riding the fader of the track or writing in automation by hand. However, I've done it and I know how time consuming it can be, especially when trying to balance out several different vocal tracks at the same time. Get the balance between your vocal tracks and throw this on there and it'll save you tons of time and let you get back to what you love to do. This is a great time saver plugin, simple as that. I'm a strong advocate of time saving and shortcuts as long as you know the reasoning for the shortcut. I've even used this to level dialogue in videos.